From time to time, scientific studies have established that longevity is directly proportional to a healthy lifestyle and a diet comprising plant-based foods like vegetables and fruits. Consumption of vegetarian foods and fast foods means lesser accumulation of toxins and chemicals in the body. All this contributes to increased life spans. Unlike meat-based foods which catalyze cholesterol production and build-up in our bodies, vegetarian foods are virtually cholesterol-free. Left to itself, our bodies are capable of producing the required cholesterol by themselves. So, a diet rich in vegetarian foods contributes to cleaner arteries and better cardiac health. People who prefer meat dishes are known to be over-eaters in comparison to vegetarians. It is noticed that vegetarians don’t usually overeat or choose foods on the basis of their emotions. That is also the reason why vegetarians are less at risk of obesity and stroke attacks. It’s a well-known fact that vegetarian food digests easily and helps the body maintain an optimum metabolic rate. What’s more, the resting metabolism rate (RMR) in vegetarians is higher and results in faster rate of burning of body fat. The next time you munch upon Kawa Nuggets and Kawa Drumstick, remember that you’re actually doing your body a favor. Apart from nutrition, vegetarian food is low on fatty acids and also easier to absorb – all of which help maintain a steady flow of blood sugar in the body – and thus keep diabetes at bay. It has been observed that in consumers of non-vegetarian fast foods, blood sugar levels fluctuate wildly immediately after they eat meat-based fast foods. Therefore, fast foods of the vegetarian type, available in your friendly neighborhood Indian street food restaurant in Brampton, are a good option. This holds good especially if you are suffering from diabetes. One of the biggest benefits of consuming vegan food, including fast foods, is a skin tone that is healthy and youthful. This is because plant-based foods are rich in antioxidants, minerals and vitamins – all of which are essential for healthy and toned skins. These foods are also high in water content, making them even more useful in our pursuit of youthful and healthy-looking skin. A serving of Veggie Planet Special Poutine in Mississauga is a great way to catch up for a quality meet up with friends as well as give your skin a dose of nourishment. Couple it with Indian drinks like Jal-Jeera and watch the good times just unfold! Since vegetarian food is high on fiber content, it aids in the digestive processes of the body. Such food also helps boost your body’s metabolic rate and flush out harmful toxins and wastes. Also, the higher water content in vegetarian foods helps the body retain healthy fluid levels. Many a research in recent times has shown that being vegetarian keeps you happier than if you’re a meat-eater. The good news is that compared to meat-eaters, vegetarians and vegans fare better on depression tests as well as mood profiles. Considering that vegetarian fare is increasingly tending towards organic farming, the health benefits are further amplified. So, when you enjoy vegetarian fast foods, your mind frame is also experiencing pleasant thoughts. The next time you’re feeling low, just walk into the nearby Veggie Planet Location in Etobicoke, Brampton and feast on Indian street food that’s healthy, tasty and easy on the pocket too. Don’t rub your eyes in disbelief but research has established the link between diet and the probability of your developing cataract of the eye. According to the studies by a prominent University in the UK, you are at a lower risk of cataract if you’re a vegetarian as opposed to your non-vegetarian friends. And if you’re a vegan, the risks are further reduced. Incidentally, you wouldn’t fail to notice the appetizing natural greens, reds and yellows that characterize vegetarian fast foods dished up by your favorite Indian fast food restaurant in the Greater Toronto Area? Finally, vegetarian fast food is good on your waistline and your wallet as well. Going vegetarian makes money-sense too as they are more modestly priced in comparison to non-vegetarian fast foods. Not only will your health improve, you also tend to save money in the long run! As you have seen for yourself, vegetarian fast foods are predominantly composed of plant and grain-based ingredients, making them powerhouses of fiber, essential vitamins like C, E, and folic acid. What’s more, vegetarian fast foods are rich in magnesium, phytochemicals and unsaturated fats. Lower levels of cholesterol in the body and lower blood pressure levels have been attributed to consumption of vegetarian foods. The best part about Indian vegetarian fast foods and street foods is that restaurants have re-engineered themselves for the modern foodie and the growing influence of vegetarianism. No longer do you have to sacrifice taste and pleasure at the altar of good health. If you’re in Etobicoke, Brampton, Mississauga, Toronto and rest of Greater Toronto Area, remember there’s Veggie Planet Naanza waiting for your palate pleasure! Veggie Planet offers convenient online ordering via website (https://veggieplanet.com) and flexible delivery options, including delivery within a 15-kilometer radius available in Mississauga and GTA. 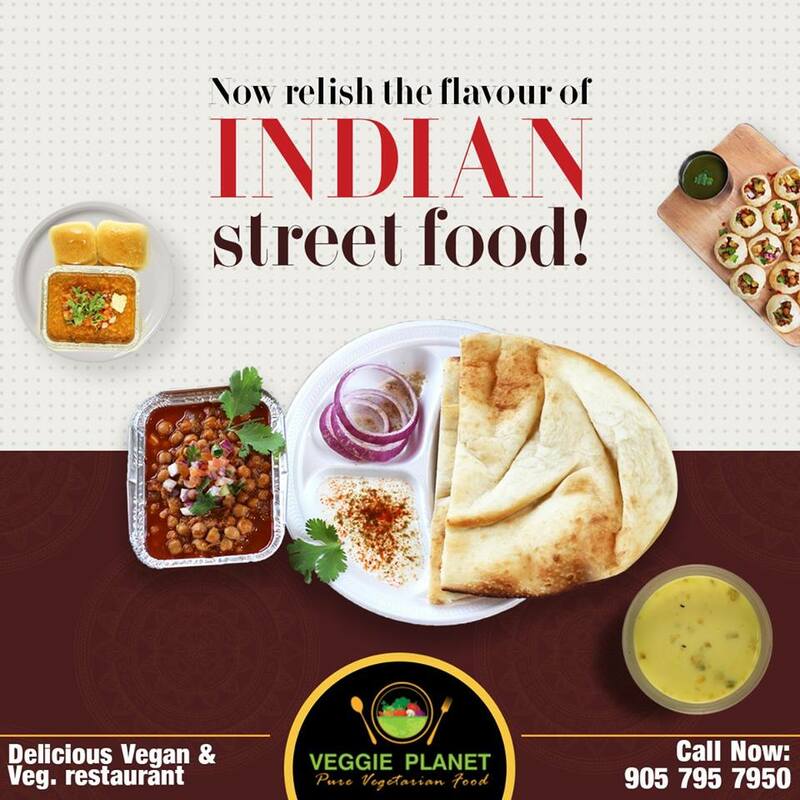 For in restaurant pickups, Veggie Planet is located at 6985 Davand Dr Unit #1, Mississauga, ON L5T 1Y7 and can be reached at (905) 795-7950 for all vegetarian and vegan restaurant menu items.